Make your kids feel important with a table and chairs that fit them to a ‘T.’ Whether you get a table and chair set or a table and chair individually, you know you are getting the best with our selection. 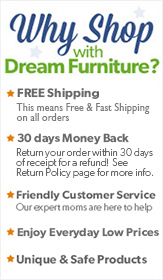 From miniature dining sets to tea sets for two to playtime tables, DreamFurniture.com has every choice you could wish for boy or girl or both. With an infinite variety of color, style, and design, our collection of children’s table/chair sets will suit your decorating, and kids’ playtime, needs just right.